The joyful women of China's 4x200m freestyle team Pang Jiaying, Liu Jing, Zhu Qianwei, Yang Yu (from left to right) flash their medals on the podium. ROME: For Zhao Jing, the new women's 50m backstroke world champion, her winning performance at the World Championships on Thursday silenced the criticism about her inability to perform on the big stage. "I've been wanting to prove myself since (the Beijing Olympics) and now I've done it," Zhao said after her 27.06-sec swim, regaining the record she had held earlier this year alongside Australian Sophie Edington. The highly touted swimmer was disqualified in the 100m backstroke heats in Beijing. The failure turned to be too significant for the then 18-year-old to handle and thoughts of quitting filled her mind. "I am very, very disappointed and even feel my life is less fun because of it," she said at the time. "I cannot get out of such a setback. China Central Television Station shot a short film reviewing my Olympic experience in Beijing. I cried hard every time I saw it played on TV." She credited her coach Shi Xiaoming for accompanying and inspiring her to return to the pool for six days immediately after she was disqualified. Gradually she regained her top form, equaling the world record in the 50m in April at a national meet. However, the Wuhan native knew going in she had her work cut out for her, after the world record fell twice in the 50m backstroke semifinals in Rome. Germany's Daniela Samulski broke it first with a time of 27.39 and Anastasia Zueva of Russia then clocked 27.38 in the second semifinal. In lane 2, Zhao swam perfectly and led from beginning to end in the final. The joy from winning was so overwhelming that right after leaving the pool, Zhao shouted "where is my cap?" only to realize that she was still wearing it. "I'm so excited. Let me calm down first," said a tearful Zhao. "It's my first world championship and this was beyond my wildest dreams." Samulski came in second, capturing silver in 27.23sec, with Chinese Gao Chang finishing third in 27.28. Zhao was not the only Chinese joining the world record party on Thursday. Championships debutante Liu Jing was also living a dream after teaming with Yang Yu, Zhu Qianwei and Pang Jiaying to capture the women's 4x200m freestyle relay in a world record of 7:42.08. They conquered their nerves to take 23-hundredths of a second off the world mark set by Olympic gold medalists Australia last year, where China were relegated to second. "This was my first world championships, and I got a gold medal," Liu said. "I never dreamed that it was possible. I was so nervous my hand was trembling even in the water." Liu wasn't on the silver-medal team in Beijing, and said that this Chinese foursome is still getting to know each other. "It's the first time we've worked together, but we trust each other," she said. With Olympic champion Liu Zige winning the silver behind Jessicah Schipper in the 200m butterfly, Chinese women have collected a full set of individual medals on Thursday. The accomplishments came a day after Zhang Lin became the first Chinese man to win a world swimming title with his world record win in the 800m freestyle. In the remaining competitions, Zhang is gunning for a gold medal in the men's 1,500m freestyle. 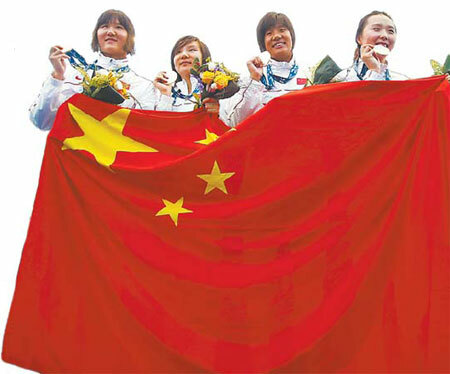 The Chinese women also have a medal shot in 4x100 medley relay.